Should Ontario Introduce New Prohibited Grounds Into Human Rights Code? Former Law Dean, now MPP Natalie Des Rosiers has proposed reforms to the Ontario Human Rights Code that would add four new prohibited grounds, including: genetics, immigration status, social condition and police records. “In my view, Ontario must have a Human Rights Code that addresses fully the new types of discrimination that Ontarians may feel and may face,” she said. ”The purpose of this bill is to recognize there is a role for government in ensuring we respond proactively to discrimination,” she added. “Social condition”, “social disadvantage”, and receipt of public assistance are recognized as prohibited grounds in some provinces already. Five provinces prohibit discrimination based on “citizenship/nationality”, including Ontario, but Des Rosiers’ “immigration status” I presume refers to status under the Immigration and Refugeee Protection Act and Citizenship Act [citizens, permanent residents, and foreign nationals]. The various immigration status categories in Canada are reviewed in Chapter 31 [The Right to Work: Immigration and Mobility Law] in The Law of Work. “Police records” and “genetics” would be new for Canada. Some Canadian jurisdictions prohibit discrimination on the basis of “record of offence”, but that is different than “police records”. 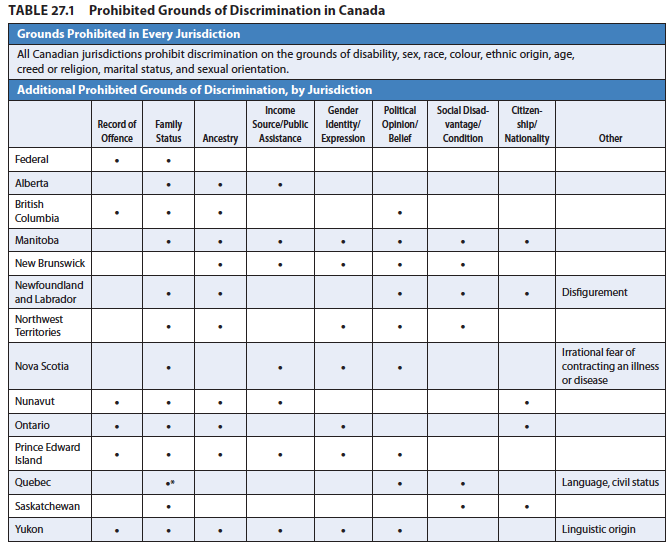 All Canadian jurisdictions prohibits discrimination on the basis of “ethnicity”, which could get at some of the same things as would “genetics”, but not all. For example, “ethnicity” would not capture a worker denied employment because her father had a disability that is genetically transmitted (although “perceived disability” could perhaps catch that scenario). Here is Chart 27.1 from The Law of Work that lists the prohibited grounds in Canada as of 2016. There have already been some changes that will have to wait until the next edition of the book to be incorporated (i.e. B.C. recently added “gender identity or expression”). Missing from MPP Des Rosiers’ proposal is, in my opinion, the most obvious omission from the Ontario Human Rights Code’s list of prohibited grounds: political opinion. Already 9 of 14 Canadian jurisdictions protect against political opinion/belief discrimination. Every jurisdiction in Canada prohibits discrimination based on “religious” belief, but political belief is only protected in some jurisdictions. Ontario is one of the 5 jurisdictions that permits discrimination based on political belief/opinion. This is an odd omission that should be remedied if we are adding new prohibited grounds. The omission of political opinion means that an employer can ask job applicants about their political affiliations or beliefs and base their hiring decision on the workers’ answer. It means an employer could order employees into a meeting and demand that they vote for a particular political party under fear of dismissal. It means that a person can be fired for wearing a political party’s t-shirt to work or putting a politician’s sign on their front lawn. Given growing political polarization in the world, with many politicians (especially on the political right) deliberately fanning division and political hostility as an election strategy, it is easy to imagine that protection of ”political opinion” at work will become increasingly important. Ontario should get ahead of the curve and following the lead of the 9 other Canadian jurisdictions that have already prohibited discrimination at work on the basis of political opinion. 1. What do you think of MPP Natalie Des Rosiers’ proposals to add genetics, immigration status, social condition and police records to the Ontario Human Rights Code? Can you anticipate what the arguments against this proposal will be? 2. Why do you think that Ontario governments have resisted including “political opinion” in the list of prohibited grounds? Should an employer be able to weed out employees based on political opinion? 3. Are there any other grounds you would propose to be added? How about “physical appearance”, “weight”, or “height”? What are arguments for and against adding any of these grounds?